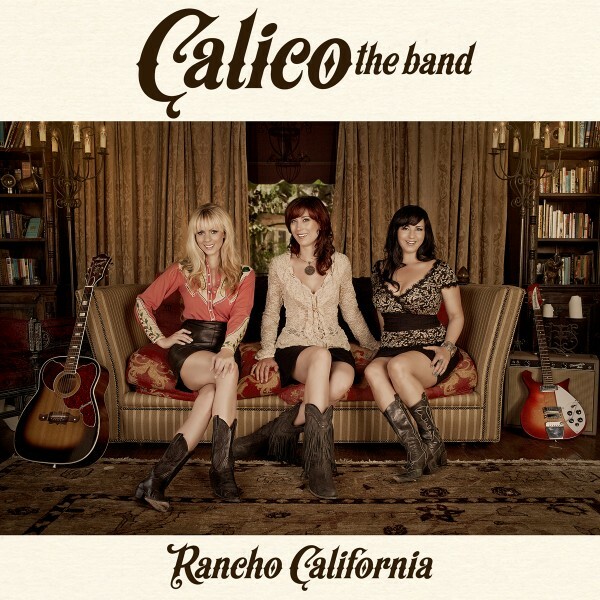 Just when it seemed that the term ‘Americana’ was being hopelessly diluted and unfocused, along comes CALICO The Band to define the term for us with new vigor and focus. In the hands and spirit of these gifted ladies, all of whom have had thriving solo careers, Americana is reborn in the spirit of Laurel Canyon, the spirt of the great songwriters (Joni Mitchell, Crosby, Stills & Nash, Jackson Browne, etc.) who flourished there. It’s there in lyrics which speak with urgency of modern times, with music of great passion and beauty, cloaked in warm acoustics and close harmonies. Rancho California picks up that torch and lights up these lyrical songs with great purity and love. But it all starts with the voices. Kirsten Proffit, Manda Mosher and Aubrey Richmond are all wonderful singers who have found a vocal blend both timeless and nourishing, and a way with harmony arrangements that is ingenious. The songwriting throughout is exceptional. “Lone Ranger” takes the iconic name and brings it to a whole other realm, the essence of great songwriting. “Runaway Cowgirl” is rooted in these western slopes, but speaking of all of America and modern times with true passion. They also choose an unlikely and great Dylan cover, “You Ain’t Going Nowhere,” a hit for the Byrds, who like this band were all about brilliant songs conveyed in immaculate harmony. Even knowing all famous versions of this one, CALICO breathes new fire into it. Aubrey’s violin and mandolin sparkles throughout, while both Manda and Kirsten bring lovely guitar textures to every track. This is an album for the ages by a new super-group of great talent and beauty. To quote the late-great Steve Allen, who was a songwriter as well as a comic genius, this is the start of something big. We don’t expect great athletes to perform as well in their later decades as they do in their 20s. Yet we do expect our musical artists to not only match the greatness of their early great work, but to surpass it. Yet it’s an unreal expectation, as we have seen time and time again. After all, writing great songs and performing and recording and producing, all of it takes a remarkable level of energy and focus. It’s far more common for our great songwriters to essentially peak in their 20s. What’s less common is when artists can sustain decades of serious songwriting, always aiming farther than they’ve been, exploring new territory and possibilities. To not only maintain greatness, but to aim beyond it. So this new album by Jackson Browne is a happy revelation, a new one to match the level of a chain of masterpieces. His work has always reached places – musical and lyrical realms – that other songwriters haven’t reached. It’s a place where spiritual and earthly concerns, and the beauty inherent in both, meets music of great emotional power. Since the start he’s brought a gospel urgency to his music, with great choirs of voices echoing and counterpointing his visceral, heart-filled vocals. Standing In The Breach is a new album for modern times, imbued with beautiful, elegant lyrics infused with the poignant perspective of age. Where he once was looking forward – and looking east – he now looks back, with wistful wisdom – to reflect on how far he’s come. “The Long Way Around” crystallizes this perspective, not only looking back on his life “running up and down Tinsel Town with the fire inside of me,” his “planets all in retrograde,” but directly straight at our current state of being. To connect with inspiration at the stage, and to write songs at this level, is a sign of great connection with the purity of song. And it’s so welcome. Beautifully and delicately produced with Paul Dieter, the record is punctuated gracefully by the drumming of some of the world’s great drummers, taking over the Russ Kunkel job in Jackson’s music, including Don Heffington, Jay Bellerose, Pete Thomas and Maurice Lewak. And although Jackson rarely collaborated, he does several on this one, including writing music, along with Rob Wasserman, to lyrics by Woody Guthrie, “You Know The Night.” And in “If I Could Be Anywhere,” he sings, “If I could be anywhere, I would be here,” planting us firmly in the acceptance of now, instead of a yearning for the past. It’s a good place to be, and gratitude to Jackson for bringing us there – which is here – is forever. Imagine, if you can, a collaboration between Hendrix and Steely Dan: complex but melodically visceral songs with ferocious electric guitar and flawlessly tight musicianship, and you get an approximation of the Fuzzbee Morse experience. An astounding guitarist who has played with countless legends, from Bono to Lou Reed and beyond, he’s a real-life guitar hero. He commands that edgy ferocity Hendrix embodied, and his solos throughout this album are revelations. Sometimes they are wildly fierce, other times touching that immaculate transcendence of the Santana realm, pure electric eloquence. Fuzzbee also sings with the spirited soulful phrasing and tone of Hendrix, and brings us not one but two faithful Hendrix covers, “Voodoo Child” and “Angel.” And while few singers can do Hendrix like Hendrix did Hendrix, and so wisely choose, like Sting did, to go in a whole other direction, Fuzzbee lights a Hendrix rocket and soars on it into the soul stratosphere. But that’s only part of the trip here. His own songwriting is sophisticated yet soulful. The man knows how to structure a song with stamina and poetry, such as the stunning supernova instrumental “Zonga!,” which is as lyrical as a song with no lyrics can be. Or a song with words, like the great “It’s Time To Go,” which revolves around a killer chord vamp before unfolding with a pure funk perfection. It’s a lesson in remarkable songwriting, with an ideal pre-chorus that explodes into the elevation chorus, punctuated by a horn section and then a great Fuzzbee/Hendrix riff. It really doesn’t get better than this. “Long As The Wind Blows” opens the show with beautiful Lennon-like melodics, a gentle melody set against counterpoint vocals, leading to a lovely chorus of sweet remembrance. “Brother Ray” is an elegy for Ray Charles and his world of soul, as Fuzzbee testifies to the lifelong impact: “I can’t say where I’d be today without the one and only Brother Ray.” The closing “Underground Railroad” is a haunting and redemptive journey that starts with a promise of liberation, “Someday I’m gonna walk on water.” Suddenly we are on gospel ground, and with the great churchy authority of singers Lisa Frazier, Willie Chambers, Joe Chambers and Tyra Juliette, we are lifted from the earthbound to the spiritual river, rafting headlong towards the eternal ocean. It’s an exalted conclusion to this musical feast. By virtue of being Fuzzbee, he was able to put together a band of his friends who happen to be among the world’s greatest musicians. The rhythm section throughout is Jerry Marotta on drums, Tony Levin on bass and David Sancious on piano and organ. Marotta also plays ocarina, rainstick, Omnichord and assorted percussion. Fuzzbee arranged and produced. Utterly amazing. An absolute masterpiece, and one which I hope others will invite into their lives. Given repeated listenings, the inherent beauty and dynamism of this dizzying collection becomes beautifully apparent, and like the greatest music, blooms ever better with each listening. An album for the ages.